The Tornio Manga liquefied natural gas (LNG) receiving terminal in Northern Finland, built under a turnkey contract by the technology group Wärtsilä, achieved another significant milestone on 27 November 2017 with the successful unloading of the first shipment of LNG. 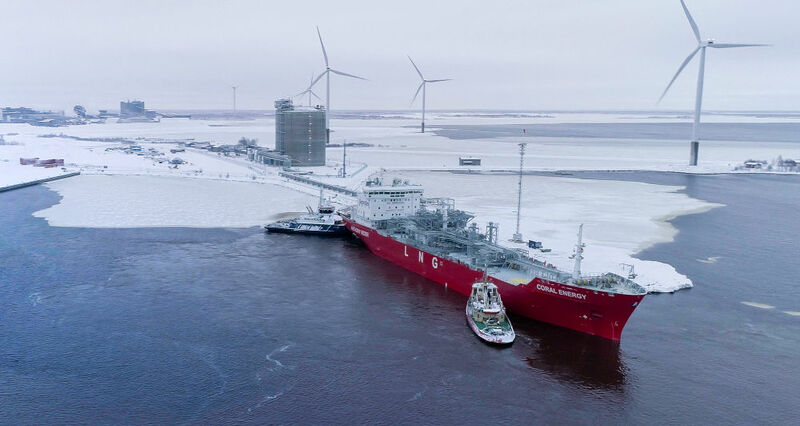 The shipment, comprising 15,000 cubic metres of LNG, arrived onboard the LNG carrier 'Coral Energy', a time-chartered LNG carrier operated by Skangas. The cooldown process of the terminal and the LNG unloading process were completed on schedule over a period of 8 days, with all safety procedures fully secured. The successful unloading marks the beginning of the commissioning phase of the project. The LNG from the terminal will be used to provide clean burning energy for local and regional industries in Northern Finland, Sweden and Norway, and will provide bunkering for LNG fuelled ships visiting the northern Baltic Sea waters. The terminal will play a notable role in promoting the economic growth of the region, while also reducing the carbon footprint of the region's industrial operations. The commercial operation of the terminal will begin in summer 2018. "The arrival and unloading of the first delivery of LNG at the new terminal marks an important new step for energy usage by local industries and shipping. Tornio is emerging as the regional hub in this Baltic Sea area, especially in Northern Finland and Sweden, which gives a considerable boost to the region," says Mika Kolehmainen, CEO of Manga LNG Oy. "We are proud to be playing a significant role in the economic development of this region in close cooperation with our customers and partners, and to have reached another significant milestone in this project. Our technologies and solutions are promoting the greater use of LNG as fuel in both the energy and shipping sectors. At the same time, each step that we take in enabling an efficient and reliable LNG infrastructure endorses our capabilities and contributes to a safer and cleaner environment," says Alexandre Eykerman, Vice President, LNG Solutions at Wärtsilä Energy Solutions. 'Coral Energy', which delivered this first shipment, is a medium-size LNG carrier vessel, powered by one Wärtsilä 50DF and two Wärtsilä 20DF eco-friendly dual-fuel engines. The tanker operates on natural gas fuel, making it one of the most environmentally friendly vessels on the seas. The vessel's emissions are clearly below the prospective applicable limits required for Emission Control Areas (ECAs). The 'Coral Energy' has an ice-class 1A class notification, thus, enabling LNG transportation to the Nordic region also in winter conditions. It is expected that more and more vessels operating in this part of the Baltic Sea will be powered by LNG fuel in order to comply with the Sulphur Emission Control Area (SECA) regulations. The world's first LNG icebreaker, the 'Polaris', which is also driven by Wärtsilä dual-fuel engines, will be bunkered from the Tornio Manga terminal during this winter season already. The next shipment of LNG is scheduled for delivery to the Tornio Manga terminal at the beginning of 2018. When in full operation, the terminal will receive deliveries of LNG at two-week intervals. The Manga LNG natural gas import terminal in Röyttä, Tornio, is a joint venture of the industrial companies Outokumpu and SSAB Europe, the energy company EPV Energy and the LNG company Skangas. The purpose of the terminal is to diversify the gas and fuel markets of the Northern region by providing Northern industry, energy production and maritime transport with a more environmentally friendly and inexpensive alternative.